Gary Ryan - Beyond Being Good: If you want to provide great service, exceed expectations! Hi Gary - Great post. I've got a contrarian view. I think it's hard enough to deliver exactly what the customer wants - every time - without worrying too much about exceeding expectations. Exceeding expectations is great - but at the right time, and only after the other normal expectations are met. Thanks for your comment. Contrarian views are healthy. I read your article but I didn't see a contrarian view. What I read was a story that reflected that expectations were not even met, let alone exceeded. In your example a pizza arriving early was below the expectations of the customer because the customer was doing other things with the 20 minutes they were told it would take to cook and deliver the pizza. Their expectation was that they would be showered and ready just in time for the doorbell to ring and , aaah, lovely hot pizza ready to eat! In your example exceeding expectations may have more to do with the flavour, correct heat upon eating and the use of fresh ingredients than delivering the pizza ahead of time. So I think we're actually saying the same thing. You can only truly exceed expectations if you really know what they are. And you can only truly meet expectations if you know what they are. As you suggest in your article the philosophy to exceed expectations is espoused in many boardrooms and management axioms. Yet it is poorly understood in practice, which is why your pizza example (a good one by the way!) occurs all too often. I also agree that exceeding expectations on a consistent basis is extremely difficult. Which is exactly why I advocate that people aim to do it. 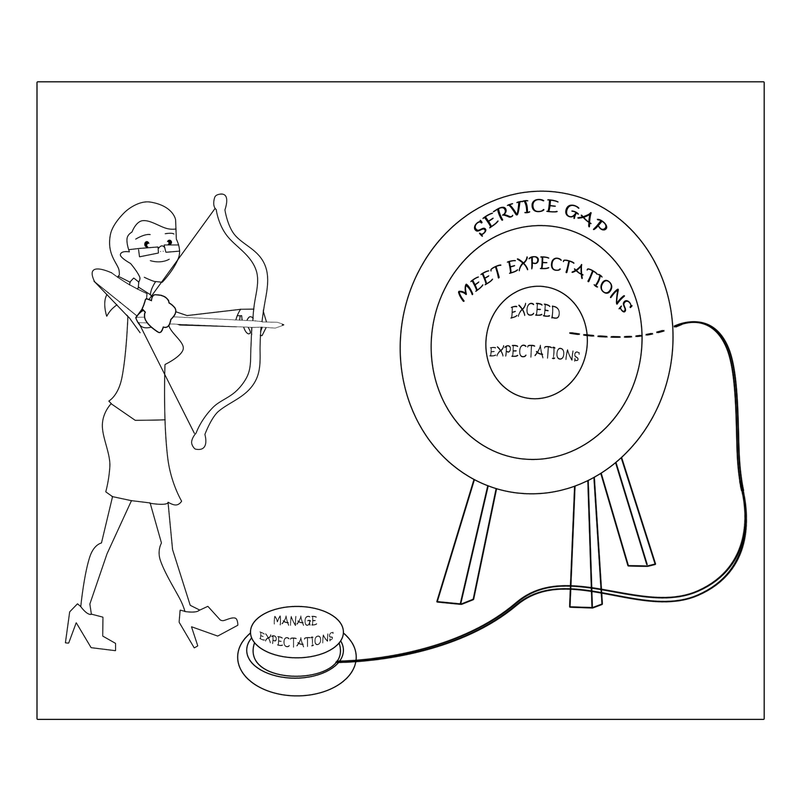 If they do their homework and really find out what their customers expect and they miss, at least they'll meet their expectations, as indicated by the illustration in my post. The 'manage expectations' button is also quite deliberate. Quite often we have to educate our customers about what they can expect. When I buy a ticket for a sports game where there is expected to be a crowd of 50,000 people or more, the information on the ticket informs me that if I want to 'miss the crowds upon entry' then I should aim to arrive 60 minutes before the start of the game. So I arrive early and it's really easy and fast to enter the stadium and find my seat. Steven you have highlighted the complexities involved in just meeting expectations. 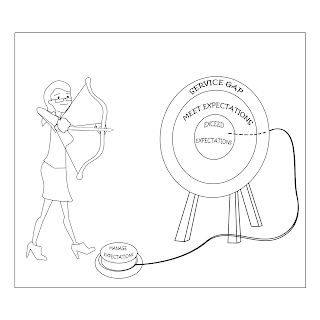 If you aim just to meet expectations and you miss, then you fall into 'service gap' territory which is a risky place to be, especially when new competition suddenly appears.